Yes, they are generic and, yes, they will overlap. That's life. The last three perhaps merit a little additional explanation. Time is a compound factor and covers things like resource availability, dependency planning, and scheduling problems which could be split out if that helps you. Goals cover things like experience you want to get, skills you want to practice, or people you want to work with. This might not be a primary factor, but could help you to choose between otherwise similar priorities. Commitments are things already on the schedule with some level of expectation that they'll be delivered. That thing you promised to Bill last week is a commitment. Put each of the factors as columns in a table. If you know some are not relevant, don't use them. If you have context-specific factors, add them. Put the tasks to be prioritised as rows. Use data where possible, and gut where not, to score each of the factors for each of the tasks. Unless there's a good reason not to, prefer simple numerical scoring (e.g. 1, 2, 3 for small, medium, large). Try to have a consistent scoring scheme, e.g. low score for something more desirable/easier/better to do sooner. Don't agonise over the scores. When you're done, add a final column which combines the scores (e.g. simple addition as a starting point). Sort your table by the scores. Your scores are your prioritisation. The prioritisation you have created probably doesn't fit your intuition. You weren't right in your scoring. The table can help you to see this. Simply review the numbers. Do any look wrong now you have them all? You weren't consistent in your scoring. The table can help you to see this too. Sort by each factor in turn. You need to weight factors in the overall score. Perhaps the downside of a delay is really big so the urgency factor needs to dominate the overall score. You have factors that correlate. This is essentially also a weighting issue, and you can always remove a column if you think it is serving no particular value in the analysis. You have missed an important factor. The order you have feels wrong. What factor should be here but isn't? Your intuition is wrong. Perhaps you have uncovered a bias? Well done! Once you've got an idea why your intuition and the prioritisation you have don't match, update the table and rescore. Pragmatism says that you should spend a proportionate amount of time on prioritising. In general you might also want to ask whether this is the right list of tasks to be prioritising at all, but that's not for now. Politics says that there may be reasons outside of reason which determine the work that gets done, who does it, and when. 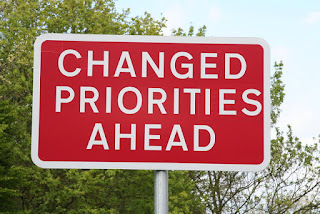 If you suspect that, then perhaps you should do something else ahead of prioritising these tasks.